The Bootlegger opening line: Two men in expensive clothes, a bootlegger and his bodyguard, dangled a bellboy upside down from the Hotel Gotham’s parapet. When Joseph Van Dorn is shot and nearly killed while in pursuit of a rum-running vessel, his friend and employee, Isaac Bell, swears to him that he will hunt down the lawbreakers. But Bell doesn’t know what he is getting into. When a witness to the shooting is executed in a manner peculiar to the Russian secret police, it becomes clear that these were no ordinary bootleggers. Bell is facing a team of Bolshevik assassins and saboteurs – and they are intent on overthrowing the government of the United States. 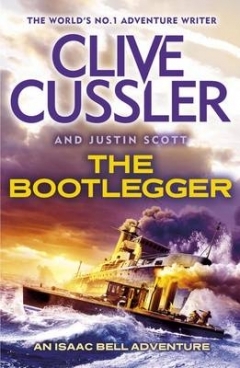 This collaboration with Justin Scott has not been my favourite Clive Cussler book. I am not sure if this had something to do with the topic of the Prohibition in America, or if it was the actual writing. Dave also did not enjoy this book so I am not going to recommend it unless you have an obsession with the period of time. The book is about Prohibition and the lengths people would take to get alcohol into the country. Coupled with that is the secondary plot of the Russians trying to destroy capitalism and instil communism into the country. Of course, the way they see to do this is to become rum runners themselves. Usually when two authors get together, I lose interest due to their different styles – shame this didn’t work out! It is a pity that the book was not as good as I expected! I have never read any Clive Cussler books, but I am looking for a new author to read. So thank you for writing about this book. I will have to go to my local library and check out some of his books. Oh, what a pity – I am generally not a fan of dual authorship – I think its often confusing. I don’t think I’ve read many books where authors have collaborated (excluding memoirs) but it doesn’t sound like both you and Dave liked it! This was not a good collaboration sadly.